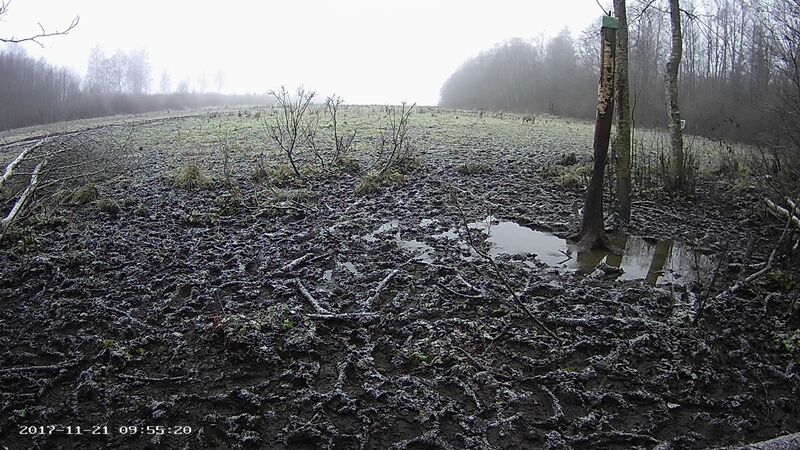 In the background of the camera image the deer flock can hazily be seen wandering around – roughly where our camera was located in the first half of autumn. So, if there is no sun, there is no power. On a clearer morning the camera managed to show images for an hour and a half, and the deer were then also visible at once. In dull and cloudy weather however the panels only produce 5% of their nominal capacity which is not sufficient to keep the system going. But we will find something in the nearest future to solve the problem because now the roe deer have their period of herd living and it is interesting to observe when the antlers disappear and how large the flocks will be that arrive in camera view in the field.